The fall armyworm does not overwinter in New England. Infestations result from fertile moths carried northward on storm fronts from southern states from mid July into September. Flights are heavier near the coast, but move inland as well. The flights are sporadic and difficult to predict, and do not necessarily correspond with corn earworm flights, so monitoring with pheromone traps in whorl stage corn is very useful. Moths (males) have mottled brown forewings with a slanting white bar across the wing, and plain light tan hindwings. They measure about three quarters of an inch long. 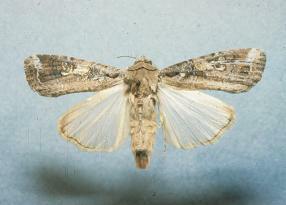 Female moths lay clusters of eggs on the leaves of a variety of host plants, preferring whorl stage corn to older corn. Eggs hatch in 2-10 days, depending upon temperature. Feeding damage from caterpillars occurs first in whorl stage corn, deep within the whorl, on leaves and in the newly forming green tassel. 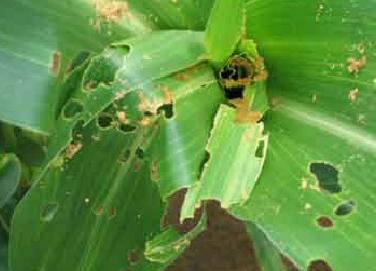 Watch whorl stage corn for ragged feeding damage and masses of sawdust-like excrement. 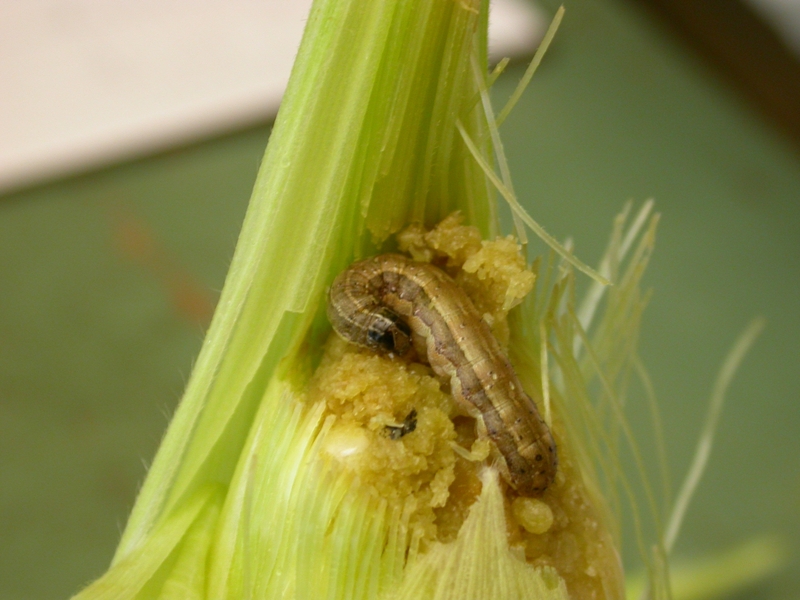 Fall armyworm larvae eat into the side of corn ears, leaving behind frass and a large hole. They also feed in the tip, making a mess of the kernels. The most effective way to prevent ear damage is to apply controls during whorl and pretassel stage. If flights are very high, silk sprays may be needed. Monitor fall armyworm moths with a bucket trap (eg Universal Moth Trap or Multipher traps) with a lure (Scentry lure, PSU type) clipped under the lid and a vapor strip placed inside the trap. Hang the trap on a stake at plant height in whorl stage corn. Count moths at least weekly. Replace lure every two weeks. Replace vapor strip every 4-6 weeks. Scout whorl and pretassel corn by checking 100 plants in groups of 10 or 20 in a V or X pattern across the field. Avoid checking only field edges, and start at random, not only where you can see damage. A plant is infested if at least one caterpillar is found. If feeding damage is old and no larva is found, the caterpillar may have left the plant to pupate in the soil. 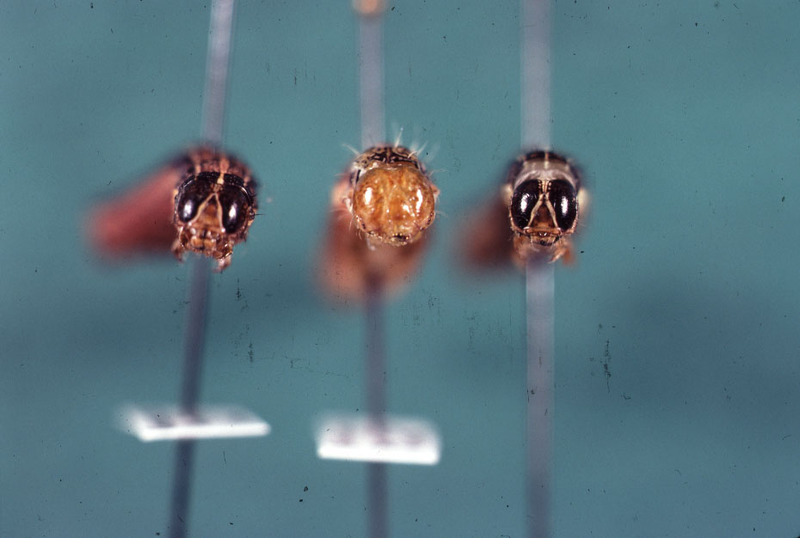 If 15% or more of plants are infested with FAW, a control is needed. In emerging tassels, combine counts for ECB and FAW. For example, if 10% of plants have FAW and 12% have ECB, the combined infestation.